When we talk about threads, Deadlock is another important thing. If you are a beginner, this may be very useful when you face an interview. What is called Deadlock ? 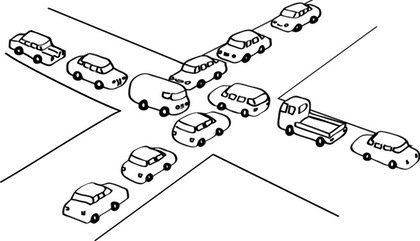 Deadlock is caused by multiple threads are blocked and waiting for each other to release the lock of the object. At the time they are waiting each other forever. Look at the following code. Then you may understand it. Sometimes it looks complex, but it is easy to understand. When you run this, you may get one of following results. It is very difficult to test for deadlocks. You may know that, testing a multithreaded application is very difficult task. This the main disadvantage of using threads. Then you can understand about the situation with Threads + Deadlocks. Because deadlocks depend on system, environment, underlying hardware etc. What is caused for deadlocks ? Mainly deadlocks are caused by inconsistent lock ordering of objects. If you have any idea to detect deadlocks it may help you to prevent deadlocks. How to prevent a deadlock ? As you know, if you use multi threads; it makes your code more complex. So you can choose multi threading only if you want in your application. If you can arrange your locks according to an order, then it will avoid conflicts with each locks. So what you can do is; assign a numeric values to each lock and you should order them according to the priority of those locks. But you should have a good understand about locks and when they are needed for each other. You can set timeout to remove conflicts between locks. You can build the mechanism to rebuild to application for random timing if it detects a deadlock. Then it will run continuously without giving any chance to deadlocks. Make locks private, then complete control is in your hand. Don't share data between threads if it is not necessary. You can use volatile fields, then it doesn't require lock and multiple threads can access the latest value of the field. This may be help to avoid deadlocks because deadlocks are unpredictable at sometimes. If you study more about the system in design time it may help you to avoid deadlocks. This may help to make your design easier to it will make easy to understand about potential deadlocks. Because it is easy to check in small blocks rather than huge blocks. post I'm going to explain about REST. REST was created in 2000 by Roy Thomas Fielding in his PhD dissertation. Really what is REST ? Now you can understand how easy that SOAP is. When to use REST ? Data can be manipulated in multiple formats (XML, JSON, XHTML, Plain text). Light weight, fast and low bandwidth is required. Only work on top of HTTP protocol. No inbuilt security and authentication mechanism. Map is used when you need keyed elements. It means, Map stores your data with a key. This map concept is totally different from other collections like List, Set and Queue. There are four main implementations. You may look at the following code to understand how to use maps to find distinct words. 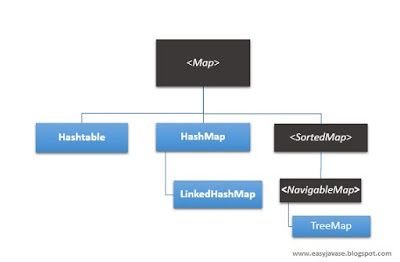 You may look at the following code to understand how to use maps to count characters in a String. Super keyword is another important one. This is a reference variable which is used to call immediate parent class. This keyword is expensive when we talk about Inheritance and Polymorphism. There are three uses of super keyword. If you use super with instance variables, it will refer the variables of immediate parent class. Once you instantiate a class, the compiler calls the default constructor of that class. If you want to call methods in parent class, you can use super keyword. In overriding it will call child class method instead of parent class. This is another design pattern that can be used to decorate an existing object without touching the structure of it. This is very useful design pattern. Just a moment think about making a coffee. You can make a coffee and then you can add milk or egg as decorators for that existing coffee. It may give additional taste for your coffee. Decorator design pattern gives this approach in simple way. Decorator design pattern shows how to do that thing in programming. Look at the following diagram to understand. In this implementation there are few components that are very important to implement Decorator design pattern. I'm going to create a decorator for making a coffee. 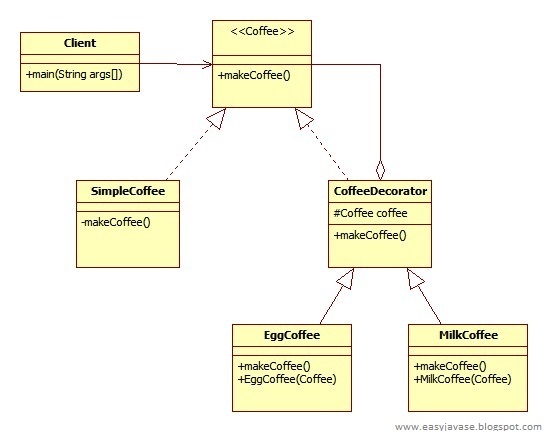 You may look at both class diagram and these classes. 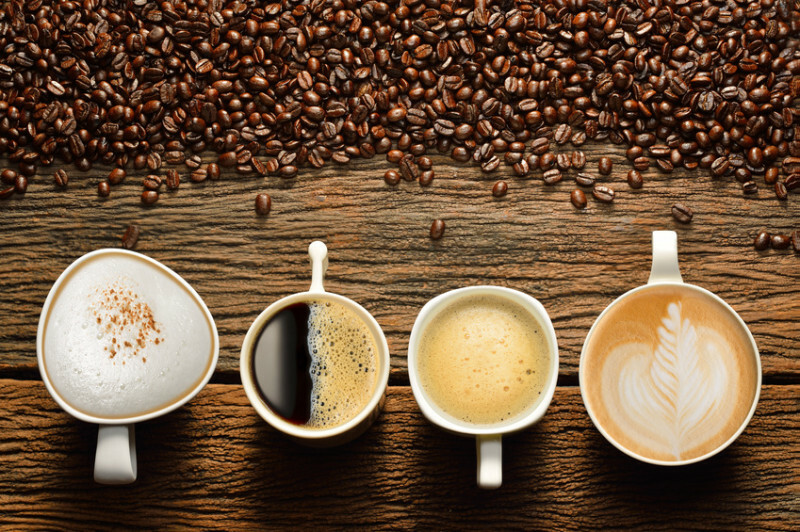 When you run this program, you will be able to see it is very easy to decorate basic coffee with this implementation. It is easy to adding new behaviors at run time without compiling the code. Provide flexible approach than inheritance when changing behaviors of objects. When it uses in Java ?